If I publish an ebook, will I wreck my chances of getting a real publisher later? A: It can. But it can also help. The answer is not clear cut. It depends on when and how you do it. 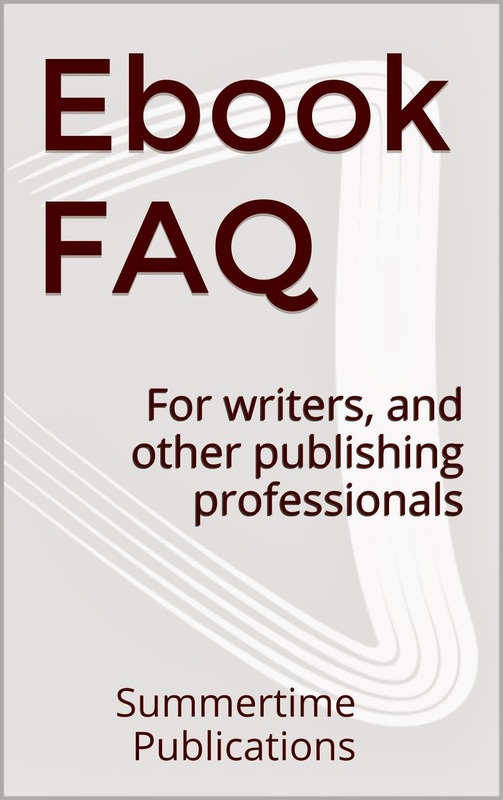 Q: How can publishing an ebook help me get a "real" publisher later? A: If the ebook is a smash hit, a big publisher may well come to you with an offer to produce and market a paperback. Or an agent might show interest in representing you. A small indie press offered to publish my ebook in return for 50% of the profits. Is this a good deal? A: It can be, provided the publisher is able to provide support that is valuable to you. This can be financial, editorial, logistical, artistic, legal, social or – especially important to many authors these days, support, help and advice in marketing the ebook. But if the publisher provides no support of any kind, then you might be better off publishing yourself directly on Amazon’s KDP, which offers self-published authors 70% of sales. Do I need an editor for my ebook? In fact: two editors. A literary editor and a copy editor. A good editor can make a book better. And the best tip for success for a writer in the ebook era remains to write a good book. What are the pros and cons of an ebook? Publishing ebooks is fast, it’s inexpensive, it costs nothing to distribute, and, if readers like your ebook, they can buy it in great numbers with no extra logistical or financial effort from you. A terrific ebook that thrills readers has every chance of getting noticed over time, especially if the basic backoffice work of writing a good description and accurate categories and key words has been carefully done and there is some communication. Also, if you discover an error or something that needs to be changed, you can fix it pretty easily and republish – if you have been careful about keeping track of your files. It is so easy to publish an ebook that overeager writers may rush to publish a book that’s not sufficiently edited, polished, or corrected. Major traditional reviewers won’t review ebooks. The act of publishing alone will not confer legitimacy; only great reviews and commercial success will. Also – and this is a big drawback for many authors – you cannot hold an ebook in your hand and sign it for your fans. Why should I publish an ebook? Maybe you shouldn’t. It depends. Ask yourself: What do you really want? If your dream is to obtain a six figure advance from a prestigious publisher with a mega advertising budget, translations in sixteen languages and a Hollywood film, your first choice should definitely not be an ebook. Take the time and make the effort to get the best agent you can find and have that agent pitch the book to publishers until your dream becomes reality. Or until the reality of publishing helps you to redefine your goals. But if your dream is simply to make your book available to anyone in the world who wants to read it, easily, and at an affordable price, an ebook might be an option worth exploring. There are many kinds of ebooks: novels, memoirs, essays, short stories, how to ebooks, ebooks to establish your brand or promote your business, ebooks in every genre imaginable and for every age and taste. It is extremely easy these days to publish an ebook with Amazon KDP. If your dream is compatible with the reality of an ebook, then by all means, give it a try. Just remember, however, that the quality control is up to you. One word of advice. Write the best book you can, then: take a moment. Wait. Have it edited. Think about the description, the categories, the release. Will you publish yourself or through a small press? Will there also be a paperback? Who are your readers? How will you reach them? What about reviews? How does this ebook fit in with the rest of your goals? Take some time. Think about the questions. Then check again. Is the ebook still the right solution for you? EBOOK FAQ: How to get reviews for my ebook? To get ebook reviews, there are several methods, but they are not all compatible with one another so you must choose your strategy. Attention: Librarything and Amazon both insist on exclusivity for ebook promotions, so you cannot have the ebook on both sites at the same time. You must choose your strategy. Likewise, Amazon will not allow you to enroll an ebook in KDP Select if it is available on Smashwords. Except for the format, the pre-publication process for obtaining reviews for an ebook is similar to the process for a paperback or hardcover. Identify the reviewers, press, bloggers and other readers you hope to reach. Prepare the pre-prepublication “press package” and ARC you want to send them. After publication, however, the ebook format offers distinct advantages for obtaining reviews. With Amazon KDP you can schedule free giveaways of your book in the hope of reaching a large number of readers who will like the book enough to talk about it and reviews it. It is advisable to give potential reviewers advance notice of the giveaway with social media, press releases or emails. At present key reviewers such as Booklist, Library Journal, Kirkus and the NYRB do not tend to accept ebooks for review (except in one case ebook romances), but this may eventually change.